Marchesi di Grésy – or, to give it its full title, Tenuta Cisa Asinari dei Marchesi di Grésy – is a landmark Barbaresco producer. It merits that not only by being one of the noteworthy, quality producers, but also by owning outright the landmark cru vineyard of Martinenga. The 11Ha Martinenga cru – strictly a Menzioni Geografiche Aggiuntiva or MGA – surrounds their winery in a concave amphitheatre, just a couple of kilometres outside the Barbaresco village, and bordering the famous Asili and Rabajà crus. This relatively steep, folded hillside faces mostly South and South-west, at altitudes around 2-300m. 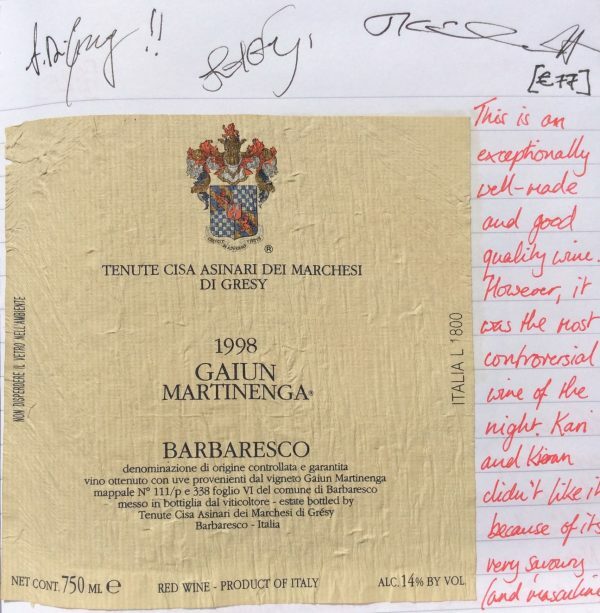 Marchesi di Grésy then split the total Martinenga cru into 3, by identifying 2 particularly fine sub-sections. Gaiun-Martinenga, is 2.3Ha on the Western side of the amphitheatre facing mostly South with some South-easterly exposure. Beyond the Eastern side and facing South-south-west is the 2.6Ha Camp Gros-Martinenga parcel. They can therefore produce Martinenga, Gaiun-Martinenga and Camp Gros-Martinenga Barbareschi in any given vintage, with Camp Gros typically matured as a Riserva. When quality doesn’t merit it, Gaiun and Camp Gros fruit is blended into the straight Martinenga bottling, as is the fruit of young vines. Having previously had the 2001 and particularly the 1998 Gaiun-Martinenga pictured above, it was clear to me why this vineyard is so well-regarded. Historically, until the di Grésy family took back the production of bottled wine, Martinenga fruit was sold to the excellent Produttori del Barbaresco co-op. The Produttori have for a long time produced a set of single cru bottlings from their members’ best fruit, celebrating the different terroirs of 9 crus, including Asili and Rabajà. But it used to be 10, with Martinenga regularly featuring, reinforcing the reputation of the vineyard. In 2017, thanks to an introduction by Ronan Sayburn MS, to Marchesi di Grésy’s long-time, Kiwi winemaker, Jeff Chilcott, we visited in 2017 and had a chance to explore more of their portfolio as well as the Barbarescos. By chance, two of the family members actively involved in the winery’s business, Valentina and Alessandro di Grésy, joined us during our tasting, having just got back from an extensive sales and marketing trip to the US. Remarkably, when we arrived on 27th September, having walked from Gaja, they had already wrapped up the entire harvest the previous weekend, including Nebbiolo. Whilst it is typical for Barbaresco harvests to be 2 weeks ahead of Barolo, it was still an exceptionally early finish. Despite that, Jeff was encouraged by the balance of acidity, tannin and fruit that had been achieved. By the end of August, they had harvested their Moscato, Chardonnay, Barbera d’Alba and Barbera d’Asti vineyards – including fruit from holdings beyond the home vineyard of Martinenga. Fruit comes into the winery at Martinenga. In the 2000s, they excavated a new cellar into the hillside to have more barrel space and a bottling line. Their barrel maturation regime is a balance of the ‘traditional’ and the ‘modern’, using both small French oak, with a relatively modest 25-30% new wood each vintage, and also large botti. That perhaps reflects the overall styles of the wines, which deftly incorporated elements of both. We discussed more of the winemaking specifics in the context of the individual wines tasted. This included Jeff endorsing Valter Fissore’s approach to Dolcetto at Elvio Cogno, of early-pressing to stop extracting too much rustic tannin. That showed clearly in the rather attractive Monte Aribaldo Dolcetto d’Alba 2015. The Barbareschi showed nice balance and some finesse of tannins, with the Barbaresco Martinenga 2014 certainly outperforming the vintage as a whole, which I have found to be somewhat dilute for many Barbaresco and Barolo wines. Both the Camp Gros Riserva 2011 and especially the straight Camp Gros 2007 showed great density with likely longevity too. I left with a bottle of their passito Moscato L’Altro 2010, which I was fascinated to open shortly after writing this up, at a Christmas lunch with wine friends at the excellent Harrow at Little Bedwyn. That tasting note has now been added below. 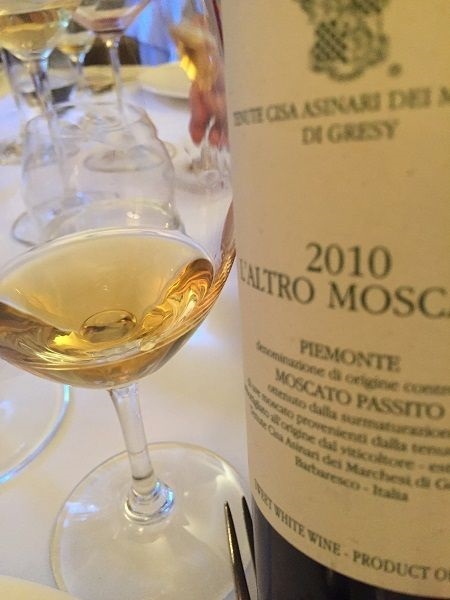 It was particularly enjoyable because the couple of Moscato Passito wines I had tasted when visiting Asti had carried a degree of oxidative character that didn’t work so well; this wine, by contrast, was harmonious and pleasant. North, South and West-facing vineyards. 2017 was very variable so having multiple vineyards helped. Stainless steel vinification. Fine lees with battonage. 2016 vintage bottled April 2017. Spring rain, then a hot July, followed by a cooler August. Less juice in the bunches, so more concentration. From Monte Aribaldo estate, around 2km from Martinenga in Treiso, at 360m altitude on calcareous soils. To handle Dolcetto’s firm, rustic tannins, they allow tannins to build to a maximum level and then press early, even if alcoholic fermentation is not complete, preferring to finish it off the skins – and take a similar approach with young-vine Nebbiolo fruit. Dolcetto can be fickle when growing, and in the winery, needs more frequent racking off lees, to prevent reduction. Young vines, designed for early drinking. Some whole berries from de-stemming. Short skin maceration and press early to keep suppleness. 2Ha, South-facing, Monte Colombo hilltop vineyard at 280m by La Serra in Cassine, Monferrato. Higher density planting than their neighbours do. Same winemaking as Barbaresco with up to 1.5 years’ ageing in botti. Initially blended with Barbera, but they rapidly split this into separate wines, hence “da Solo”. €20 / bottle. They are progressively delaying releases of their Barbareschi and starting to release, step-wise, by vineyard. The 2014 vintage has been talked down overall, but Jeff believes it is important to taste each wine to know its own quality. Lots of spraying was done up to harvest, to manage the cool, damp conditions, then a severe selection was made at harvest. Slow maturing, long growing season vintage. 12 months in 30% new French oak, then 18 months in large botti. N: Black tea and truffle, but no overt VA. Dried cherry and orange peel. Dense. Aromatic. Drunk with dessert at The Harrow at Little Bedwyn in December 2018.